Cut the bread in small slices and toast it in the oven or in the bread toaster. Cut all the tomatoes and the avocado in small cubes and chop the cilantro leaves. 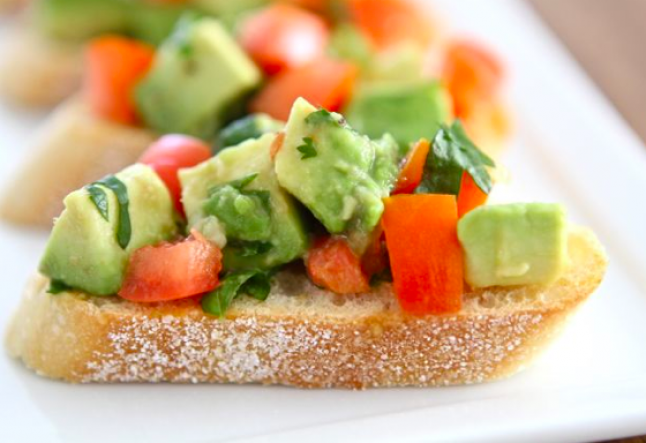 Place the tomato and avocado cubes in a mixing bowl, add the chopped onion, salt (to taste), and the lemon or lime. Mix lightly. Spread a small amount on the toasted bread. Place the Bruschetta on a serving plate and drizzle some olive oil on top. Notes & tips: You can substitute cilantro (also known as coriander) for basil.